A change in language from Fed chair Powell put big investors back in buy mode, and the market rallied from there. At the G-20 summit this weekend, the U.S. and China agreed to start negotiations and ease trade tensions, with the U.S. postponing plans to increase tariffs on Chinese goods. A solid week of trading, the perception of a more accommodating Fed, and a temporary reprieve from tariffs puts the markets back in an uptrend, just in time for the annual Santa Claus rally. 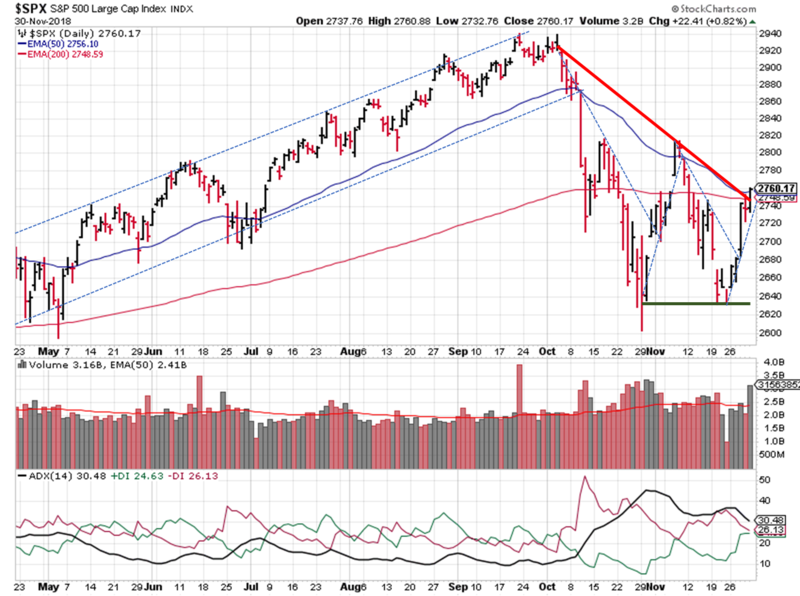 All the indexes start this week above their 20 day moving averages. 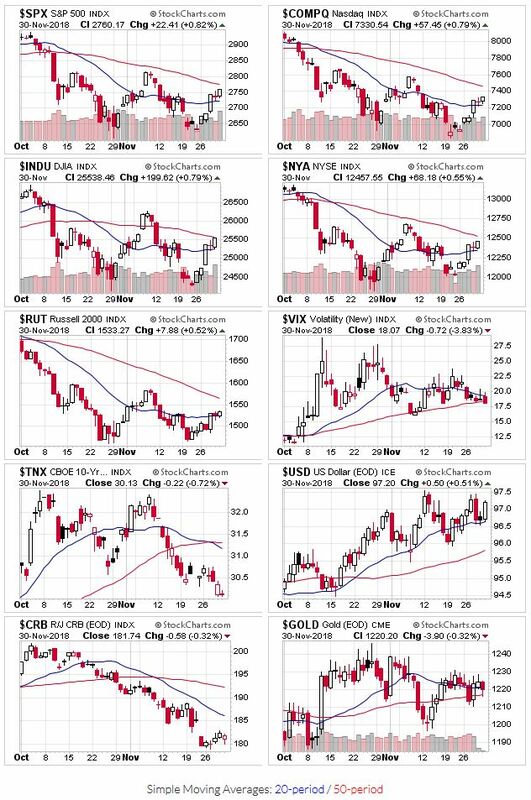 And their all fairly close to, if not right above, their 50 day moving averages. So this signal moves from downtrend to mixed. The price/volume signal switches back to an uptrend signal, with last week's gains coming on higher trading volume. Growth stocks have had 6-8 weeks to build new bases, so this is about the time you'd want to see new breakouts from names that held up well during the sell-off. Time to check those buy lists! OEW switched to an uptrend. It appears they ~2 weeks early in the call for an uptrend...a common issue when trying to call a trend change. The S&P ($SPX) found its footing, looks set to give us that Santa Claus rally to close out the year. Prices broke through the second leg down (after failing to do so on the 19th. The index also closed just above the October/November downtrend, another positive sign in line with the uptrend generated by the signals above. The ADX isn't quite there yet, but is trending in the right direction (DI- coming down, DI+ rising, and the weakening bearish trend). Looking back of the past few weeks, you can see the back and forth between uptrends and downtrends in each of the signals. This is one reason to use more than one signal in your trading process. It's not perfect, but the odds of success are higher...or the odds of being wrong and losing money are lower, if you have your safe investing hat on.